I've been crocheting for over 40 years. I'm finally trying my hand at writing a pattern. If you crochet, please try out this pattern and let me know how I can improve it. 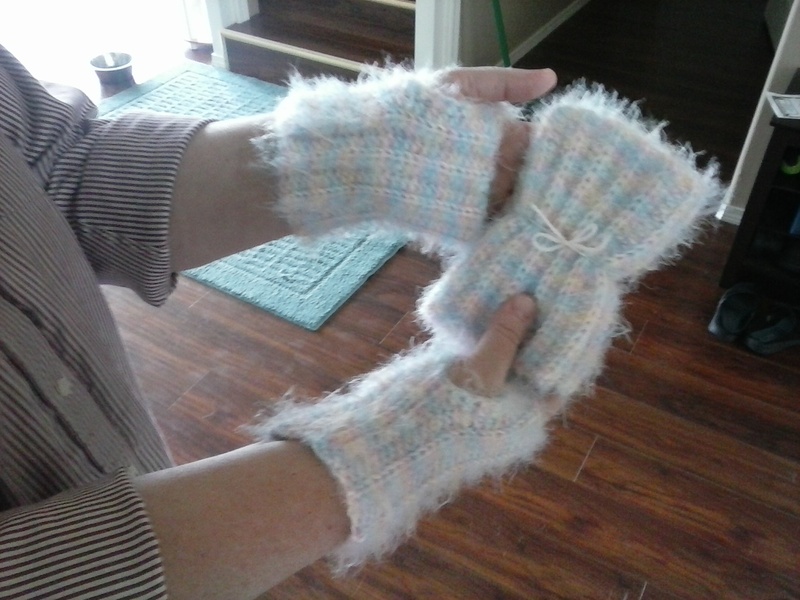 This pattern makes LARGE mitts. To make them smaller, work 15 or 16 rows instead of 18. You want it to fit comfortably around your hand just under the fingers and around your forearm as high up as the mitt goes. It should be a little loose around your wrist. Keep in mind that this stitch will stretch more than regular crochet. If you want the mitts to go farther up your arm, just increase the number of HDC for each row. Starting chain should be number of HDC plus 2. The pattern works vertically up and down your arm, not around it. The finishing row makes a seam up the side of the mitt from your wrist, around your thumb, and just under your first finger. The chain pattern on the surface of the mitts is from the top of the HDC row before. Row 2-17 - In back loop of row before, 25 HDC across, ch 2, turn. Row 18 - In back loop of row before, 25 HDC across, ch1, turn. Row 20 - This row stitches the side seam together. Match up top and bottom of piece. Work 1 SC through both the last stitch of Row 18 AND first chain of Row 1. Work 3 more SC the same way. Using ONLY the beginning CH, work 6 SL ST. Skip 6 stitches on Row 18. In next stitch of BOTH rows, work SC. This makes the thumb hole. Continue working SC together to the end of the row (15 SC from thumb hole to end). This should stitch both together and leave a thumb hole. One SL ST to the side of the finished seam, then fasten off yarn. Weave in ends to finish.